PYONGYANG, North Korea (AP) — Dennis Rodman said Monday that a game he and other former National Basketball Association players are planning in North Korea will be a "birthday present" for one of their most unlikely fans: leader Kim Jong Un. Rodman's squad — featuring ex-All Stars Kenny Anderson, Cliff Robinson and Vin Baker — will play against a team of North Koreans on Wednesday, which is believed to be Kim's birthday. 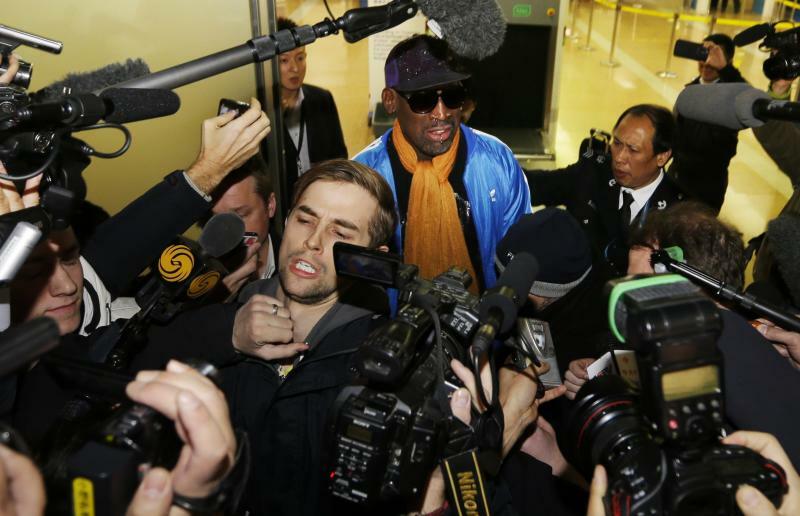 The former NBA players, who arrived in Pyongyang on Monday, also include Eric "Sleepy" Floyd, guard Doug Christie and Charles D. Smith, who played for the New York Knicks. Four streetball players also are on the squad. "The marshal is actually trying to change this country in a great way," Rodman said of Kim, using the leader's official title. "I think that people thought that this was a joke, and Dennis Rodman is just doing this because fame and fortune." Instead, he said, he sees the game as a "birthday present" for Kim and his country. "Just to even have us here, it's an awesome feeling. I want these guys here to show the world, and speak about North Korea in a great light," he said. "I hope people will have a different view about North Korea." NBA Commissioner David Stern issued a statement Monday night. "The NBA is not involved with Mr. Rodman's North Korea trip and would not participate or support such a venture without the approval of the U.S. State Department," Stern said. "Although sports in many instances can be helpful in bridging cultural divides, this is not one of them." The game will be another milestone in Rodman's surprising relationship with Kim, who rarely meets with foreigners and about whom very little is known outside of North Korea. Rodman is the highest-profile American to meet Kim since the leader inherited power after his father, Kim Jong Il, died in late 2011. Rodman traveled to North Korea for the first time last February with the Harlem Globetrotters for an HBO series. After spending time together, Rodman called Kim a "friend for life" and came back just before Christmas to hold tryouts for the North Korean basketball team, though he did not meet with Kim then. Relations are also tense because of the North's development of nuclear weapons and its threats to use them if a conflict breaks out with Washington or Seoul. Rodman also has been slammed for not trying to use his influence with Kim to secure the release of Kenneth Bae, an American missionary with health problems who is being held in North Korea on charges of committing "anti-state" crimes. To make the trip more complicated, Kim's once-powerful uncle was recently executed for a long litany of alleged crimes, including trying to divide the regime and usurp power from Kim. Although that has generated speculation abroad about the regime's unity, North Korean officials say the execution settled the issue and there is no instability. "I'm not a president, I'm not a politician, I'm not an ambassador," he said before arriving. "I'm just an athlete and the reason for me to go is to bring peace to the world, that's it. That's all I want, no money. I want no money, no money." "It's new being here, but overall the concept is not new," he said. "The team is made up of a lot of guys who really care, that's the most important, it's not about bringing dream-teamers. It's about guys who are coming that want to be a part of this, that care, and really that care about humanity."